My wife has a saying "what goes around, comes around". Like planetary pinions in an epicyclic train, my friends and interests seem to have 'recycled' within the gearbox we call life. With my own speedo currently hovering over 60 (years, not mph!) I couldn't help thinking "what triggered my recent return to cyclemotors"? It all started when I was a poor, sixteen year old apprentice mechanic. I had a rather gutless Cyclemaster that I used for work and the once a week ten mile journey to the Tech College. One really wet winter day it broke down, so, after pedalling it the remaining eight miles I was not a happy student. At lunchtime I gave it to a fellow apprentice and I got the bus home. 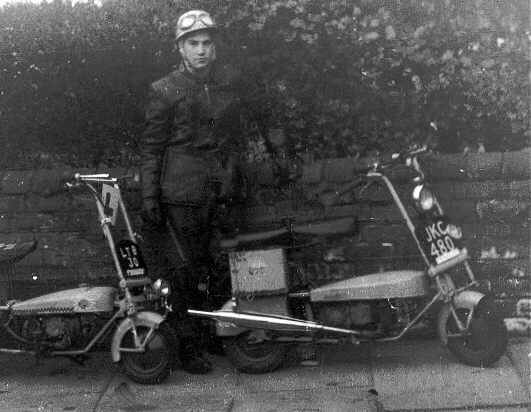 Two weeks later Mr Plod was knocking on the door, the Cyclemaster's new owner had got himself, (no, me) into trouble, I can't remember exactly what law had been broken, but he had probably dumped it, likely without even putting his name in the logbook. A brace of Corgis followed. My friend and I probably (looking back on it) terrorised the neighbours as we showed off to the local girls. Those low centre of gravity Corgis could certainly get around corners quickly. The only problem, the footrests would dig into the tarmac. So, I stuck a couple of old ball races on the ends! A two speed hand change James Comet came next, I rode it like my Corgi and dropped it a couple of times, so I moved onto a real motorbike, a Velocette. It was a 200cc Valiant, which used a flat twin air cooled OHV variant of the popular water cooled LE Velo engine. A nice smooth running bike but was a bit heavy on the 10 millimetre Lodge spark plugs. It also snapped its gearbox layshaft (due to metal fatigue). I eventually swapped the Valiant for a rather fragile 750 Renault. My French experience started badly, the fibre timing gear split. Luckily in the pre-cam belt days this didn't result in a wrecked engine, just wrecked pride when I had to have it towed home. Playing with funny French cars was put on the backburner once I got married; a reliable sensible car had to be found. I ran an unexciting Ford Corsair for a couple of years. By now I was foreman of a small garage. Occasionally uneconomic to repair cars (for the owner) came in, one such was an early Volvo P1800 sports that I bought and, after a lot of bodywork repairs it proved to be a tough, reliable car for many years. We also had an old 50cc Honda step-through that my wife used to do the shopping. What a workhorse it was. We once took it up to Skye in a little trailer, behind the Volvo. Then loaded the camping gear onto the bike and left the Volvo on the Quay. We then set off on the ferry to the Outer Hebrides. We had a glorious week touring Harris and Lewis on the Honda. On many occasions we had to zigzag the bike up the, luckily deserted, steep mountain roads. Sadly the Honda was replaced by my wife's desire for something more stable, an Ariel 3. Bad move! The little, virtually suspension-less three wheeler proceeded to shake, rattle and roll itself to pieces over the next year or so. Around this time (the mid-1970s) one of our customers was a guy called Mike Daly, but more about him later. And so it came to pass that another French car, a Panhard, came into the workshop. Now to the average garage mechanic a good car to work on was a Ford or a Morris Minor. Most would avoid like the plague anything Foreign and Fiddly. Special tools, techniques, awkward knuckle skinning jobs earning no bonus. But the Panhard 24 Coupe was a pretty car, powered by a front mounted 850 cc air cooled flat twin. I suppose some subconscious memories of the little Valiant engine caused me to take an interest in the car. It needed new syncro cones in the gearbox, a new clutch and a complete exhaust system and, to make it worse, Panhard had already stopped car production to concentrate on more profitable military vehicles. Spares were difficult to find (only one dealer remained in Slough) and a workshop manual was unavailable. I was up for a challenge and bought it from the customer, who snatched the money quicker than flashing speed tax camera! Some months later it was back on the road. Almost 30 years (and four Panhard's later) I'm still playing with them. What's all this got to do with cyclemotors you're probably thinking? Well, like a black hole, all sorts of people are attracted to the Panhard marque. Five years ago I joined my local vintage and classic car club in Chester. In doing so I renewed my contact with Mike Daly, who edits and produces the club's magazine. He is also a NACC member and has a few interesting lightweight motor bikes. Another member of the Chester club runs an early 1908? Wall Autowheel. I get over to France a couple of times a year and Mike asked me to look out for any VéloSoleX for sale. He's now got about half a shed full while I have about three, currently in pieces. As a thank you he proposed me to the NACC and paid my first year's subscription. There's more: the new Panhard event organiser and good personal friend is Roger Caunt, who, I discovered is the BSA Winged Wheel expert. Roger runs a very rare DB Panhard. We have had some great adventures doing a few continental Panhard rallies in this car. Two years ago we made a bit of a detour, more a pilgrimage (about 300 Miles) to have a memorable lunch and chat with Bryan Hollinshead, whose 'Alistair Cook like' letters from Brittany are always a good read. Until a couple of years ago the Panhard Club magazine editor was another Solex expert, David Beare, which brings me towards the end of this tale. Just before Christmas I was back in France and took a book over to read. It was 'The Stinkwheel Saga'. What can I say? Forget the term 'less means more'. In this book's case 'more' means very much more. Without the background history of why the manufacturers had to develop these little power units it would just be a reference manual. With the history it was fascinating, I can't wait to get my hands on part two. To complete the cyclemotor circle the first Solex I bought (a 'barn find' in France) is hopefully to become a runner this year. And a Honda 50 may join the restoration queue, behind that original Panhard 24 (yes I still have it) awaiting its second facelift!